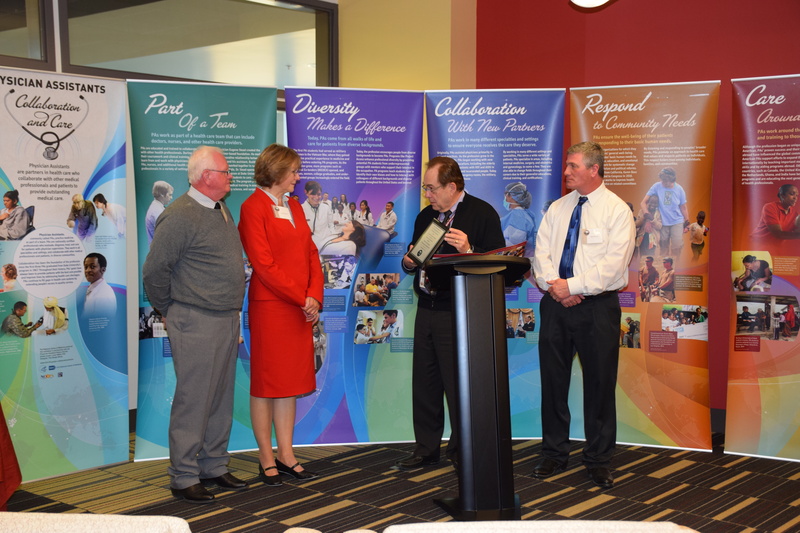 Rocky Vista University (RVU) celebrated the history of the Physician Assistant profession with a National Library of Medicine traveling exhibit and a special reception honoring Roy Havens, one of Colorado’s first PAs and RVU community member. The traveling exhibit, “Physician Assistants: Collaboration and Care,” was on display in RVU’s Frank Ritchel Ames Memorial Library from November 17th to December 2nd. The exhibit featured six large panels that describe how the Physician Assistant profession developed as a solution to meet the social and health care needs of the mid-20th Century and continues to evolve today. The exhibit was on loan from the National Library of Medicine. On November 30th, the RVU Physician Assistant program invited all faculty, staff, and students to a special reception honoring Roy Havens, PA-C. Mr. Havens was the father of Dan Havens, Director of Public Safety and Security at RVU. “This is a great tribute to my father and I am very proud that Rocky Vista University honored him in this way. The University will forever be part of our family,” said Mr. Havens. The RVU Physician Assistant Program anticipates matriculating its first class in September 2018, pending accreditation approval.